MONTGOMERY, Alabama – Commerce Secretary Greg Canfield will lead a business development and trade mission to Belgium and The Netherlands next week that showcases Alabama’s capabilities in bioscience and research. The Alabama delegation heading to Europe on the five-day mission beginning Monday is made up of bioscience companies, research organizations, trade experts, and economic development officials from Birmingham, Mobile, Opelika, and Tuscaloosa County. The delegation’s goal is to forge new business relationships, identify opportunities for collaboration and investment, and learn more about the bioscience industry in Belgium and The Netherlands. Delegation members will make presentations to counterparts in both countries, engage in networking, receive briefings and take facility tours. Secretary Canfield will share a presentation on Alabama’s growing bioscience industry with business and government leaders in both Belgium and The Netherlands during the mission. Bioscience is one of the key target sectors in Accelerate Alabama, the state’s strategic economic growth plan. 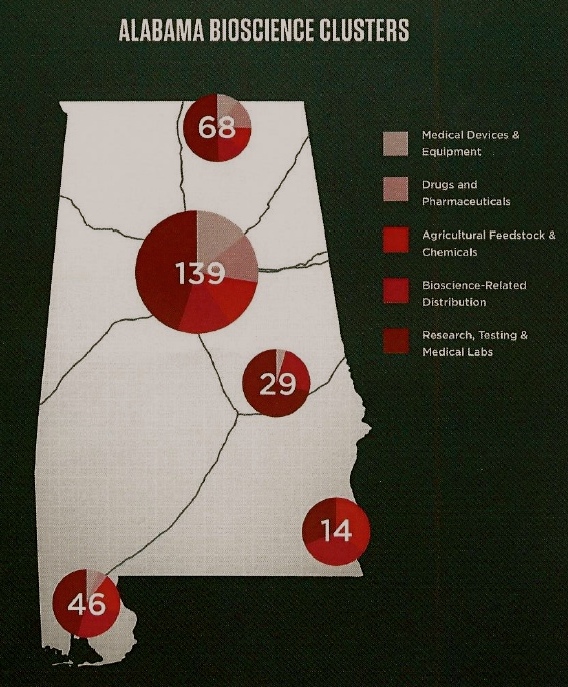 More than 10,000 Alabamians work in bioscience, and nearly $5 billion is spent each year on bioscience-related research and development in the state. In addition, the state boasts resources such as the HudsonAlpha Institute for Biotechnology in Huntsville, and the University of Alabama at Birmingham (UAB) and Southern Research Institute in Birmingham. Dr. Robert Kimberly, director of UAB’s Center for Clinical and Translational Science (CCTS), said the trade mission offers the university the potential for new collaborations in discovery research, especially in the life sciences. The CCTS partnership network brings together several institutions for research and training to improve health care delivery. “With our emphasis on clinical and translational research, fostered through our Center for Clinical and Translational Science, we see the opportunity for sharing best practices and for developing partnership strategies in new therapeutic strategies,” Dr. Kimberly said. “Our Phase 1 clinical studies unit may provide the setting to exploring new treatments and understanding disease mechanisms. We also look to (share) new technologies that we can apply to our mutual programs,” he added. Beginning Monday in Brussels, members of the Alabama delegation will get an up-close look at the life sciences sector in Belgium, with briefings from industry officials and government representatives. On Tuesday, the group will visit the Flanders Life Sciences Research Institute in Ghent and UCB Pharma, a biopharmaceutical company in Braine l’Alleud, south of Brussels. On Wednesday, the Alabama group will arrive in The Hague, where it will hear about the life sciences and health sector from Dutch officials and lawyers. On Thursday, the delegation will tour the Leiden Bio Science Park, home to more than 85 medical life sciences companies and several research institutes. “The trade and investment mission is expected to enhance the perception of Alabama as a rising biotechnology and life sciences region and highlight its strategic importance in a global industry,” said Hilda Lockhart, director of the International Trade Division of the Alabama Department of Commerce. Lockhart said companies in the Benelux region are interested in identifying international partners for licensing agreements and joint ventures, while governments in Belgium and The Netherlands are strong supporters of their biotechnology sectors. Atherotech Diagnostics Lab: The Birmingham-based developer of the VAP cholesterol test is actively expanding its capabilities into other patient health risks. Evonik Industries: The German industrial giant, which has developed drug delivery technologies, announced plans this year to open a research center focusing on medical devices and technology in Birmingham. MedSnap LLC: This Birmingham startup has developed a system to authenticate pharmaceutical pills and capsules using a smart phone, enabling a clinician to screen them for safety. Swift Biotechnology LLC: The Mobile-based firm is using technology pioneered by the University of South Alabama’s Mitchell Cancer Institute to develop screens and diagnostic tests for endometrial and ovarian cancer. Research organizations included on the mission are UAB, the University of South Alabama, and Huntsville’s CFD Research Corp. Economic development organizations included are the Birmingham Business Alliance, North Alabama International Trade Organization, the Tuscaloosa County Industrial Development Authority, the City of Opelika, and the Alabama Small Business Development Center. The Mobile Area Chamber of Commerce and the U.S. Department of Commerce’s Birmingham office are sponsoring the mission with the Alabama Department of Commerce.